"These Wicked Things" begins with an instrumental song which sets the mood before the second song has vocals. At first this reminds me a bit of Ed Schrader's Music Beat or even Elvis Presley. There are these strong Bob Dylan / Tom Petty vibes on "Bad Motel" which just has the deep horns in it to rock. In the vocals at times I hear Beck while this can get into that driving rock n roll feel just as easily and remind me of the one and only Johnny Cash. Could you imagine some kind of ensemble of Dylan, Cash, Petty and Beck? Someone should get Bob Dylan and Beck to work together right now. While there are instrumental songs on here, there are also songs with words and it's a nice way to make both sides feel equally important. "Gone, Gone, Gone" starts with that changing of the radio static but then kicks in with that cool jazz sax, cymbals and spoken words like The Beats. It's just coolsville, daddy-o, ya dig? "The Girl From The West Country" opens up like a Tarantino film and is also mostly instrumental before we get into that acoustic guitar / horns and whistling vibe that is like the film "Desperado" or even "Rango" that is the song called "Rosita (Tango)". "The Key" is a nice slow, dark rock and it's followed by an instrumental, western type of song which brings about thoughts of Urge Overkill. "Rosita (Huapango)" comes in like a salsa dance while the song after it has a flute at the lead. "The Evening Redness In The West" has this wild jazz feel to it, though there are also these church bells, and on "The Last Man (Is Anybody Out There)" the spoken words return though there is also singing. That song also makes me think of a sense of desperation, isolation and that just plays into the end of the movie so well. 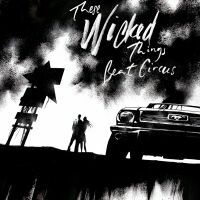 For me, "These Wicked Things" is less about songs and it's more about acts. I don't feel like this is audio as much as it is visual. From the start until the very end this is telling a story. It does so with sound, but it is much more clear than some films I've seen. If you want the shortest possible review of this you could simply state that it is what it would be like if Quentin Tarantino had directed "Rango". That, by the way, is a movie I would have definitely watched in theaters, as I love both Tarantino and the film "Rango" very much. Aside from that incredible combination this music is just spot on. I think back to the song "Gone, Gone, Gone" for example. I'm not sure whether or not this is meant to be an album with a theme or if I just hear it that way. Sometimes when you make concept albums it's best not to be able to pull individual songs out- you want them to all feel best when experienced together. Here, you can pull songs out and just hear them and go "Wow, that is good". You don't need to sit down and listen to this album from start to finish to truly appreciate it or experience but you most definitely should.